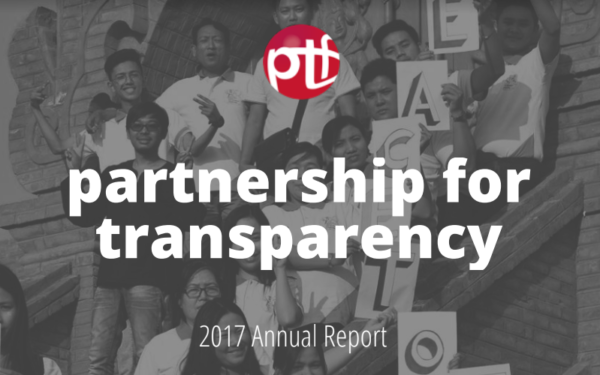 We are excited to release our 2017 Annual Report showing how Partnership for Transparency (PTF) has created and sustained impact throughout 2017, building on now 17 years of work promoting and supporting citizens demand for good governance. Throughout 2017, PTF provided technical assistance, strategic advice, networking and knowledge services to advance citizen-led initiatives and improve citizen engagement for more accountable societies. The 2017 report highlights these activities, events and products. We are also proud to highlight the work of our partners in the field as the are the true catalysts for successful citizen-led change in communities suffering from corruption and the abuse of power.